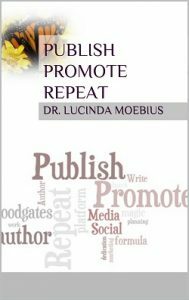 In Publish Promote Repeat, Dr. Lucinda Moebius provides a comprehensive marketing strategy for any author new to the marketing game. The majority of writers just want to write — if they loved marketing, they’d be marketers. Count me among the majority. So when Dr. Moebius offered me an advance copy of Publish Promote Repeat to read and review, I jumped on it. Anything to get an edge. For me, the ideal marketing book would be automated to do marketing for me, but robot books don’t exist yet. The closest we can get to having marketing tasks done for us is to have them set down in a no-brainer, any-dummy-can-do-this format. Moebius breaks the marketing strategy for a book into three phases: prepublication, publication, and post-publication. The prepublication phase begins with the writing process. You can market the hell out of a book, but if the book is poorly written, it won’t get the word-of-mouth required to generate sales. Her advice here is solid, and she includes timelines to help authors set deadlines. Anyone who’s tackled NaNoWriMo knows deadlines are a writer’s best friend. Sometimes, the only thing driving a project to completion is the drop-dead date, even if it’s self-imposed. The book is well written and a quick read. Moebius includes checklists and charts to help with budgeting and social media strategies. She even includes flowcharts to help you decide what type of book you might want to write. This book makes a decent reference for writers striving to improve sales of their books through their own marketing efforts. After I finished the book, I contacted Dr. Moebius, and she agreed to do an interview with me. Q. Are you primarily a non-fiction author, or do you mainly write fiction? Which do you enjoy writing more? A. I consider myself a writer. Although my main area of focus is fiction, I do occasionally delve into the world of non-fiction. I wrote my first non-fiction piece, Write Well Publish Write, in response to many fans asking me how they could write and publish a book. Most of the writing is based on lessons I teach in my classroom, so the book was actually quite easy to write. Publish Promote Repeat is a continuation of the lessons I have learned about developing a promotional platform over the years. My first love will always be fiction, specifically Science fiction and Fantasy, although I do write in other genres as well. Q. What compelled you to write a marketing book? A. I believe I was inspired to write the book. I was studying ways to market my own books and taking notes on many of the ideas I researched. As the ideas came together, I realized I had created a marketing plan that was actually increasing my own book sales. Since the majority of ideas were written down already, it didn’t take much effort to organize them into a book. The marketing plan developed almost by accident. I manage a fairly active writers group on Facebook which does not allow promotion. As a way to help clean up the promotions in the group, I created a sister group for promotions. It grew rather quickly, and I decided that instead of a pure promotional group, I would turn it into a group for learning about promotions. I was able to learn quite a bit from the group as well as through my own studies, so I decided it would be a good idea to write a book about it. Q. What advice about the marketing process surprised you the most and why? What advice did you find the easiest to follow? Most difficult? A. The most surprising advice I have ever heard about marketing is this: Marketing is not about selling your product; it is about selling yourself. When I make a book sale, I sell one book, but when I sell myself, I am selling everything about me. My audience will see me as a writer and they will be interested in everything I write. They will look at my website, my social media, my blog and, most importantly, my books. When readers trust I am giving all of my talent and myself to my writing, they will be interested in everything I produce. The easiest piece of marketing advice for me is to be active on social media. I can’t stand the post-and-go concept. My goal on social media is to be active and interactive. The most difficult piece of advice is to use multiple platforms for social media. I tend to get tunnel vision and am only able to focus on one social media platform at a time. I’m hoping to have more time over the summer to expand my social media reach. Q. What do you think is the biggest mistake indies make when marketing their books? A. Indies are afraid to market themselves. They are great about talking about their books and their collected works, but they are afraid to talk about their personal lives. We get excited about our books and that is all we can talk about when we are in public (or on social media). We need to give ourselves to our audience. When you are promoting, consider ways you can promote who you are instead of just talking about your books. Q. What is your next big project? Will we be getting more non-fiction from you in the future? A. I have two books I hope to get out this year. The first draft of my next paranormal novel should be completed by the end of June and the third in my science fiction should be completed by the end of the year. My paranormal series is a trilogy and my science fiction novels are designed to promote fan fiction. I am writing five books based on five generations of a family. My hope is fans will develop other books based on characters from those five books and start producing their own stories based on the world I create. I will also continue to blog and produce my Stream of Consciousness stories. At this point, I do not have plans to write more non-fiction, but you never know when the inspiration hits. I have a number of fiction books outlined so I plan on working on those first. Publish Promote Repeat is available for purchase on Amazon.